Atlanta Memorial Depot . . . makers of quality headstones, mausoleums, grave markers, cemetery stones, stone monuments, cremation urns, pet memorials, tombstones, grave stones, granite memorials, grave monuments, head stones, gravestones, and cemetery monuments. Behind every memorial we create, from a simple grass marker to an elaborate monument there is a level of professionalism that is appreciated by the eye and understood by the heart. Atlanta Memorial Depot has the largest display of monuments in the Atlanta metropolitan area. This gives you a wide range to select from, and you can see the actual size and color of the monuments. Our wide selection of monuments can be furnished in various sizes, styles and designs. Let us help you select an enduring memorial. We stand behind our work with a 100% Satisfaction Guarantee. There is no middle man, no hidden costs. Our experienced sales and design staff excel in giving you the best in customer service. You can expect delivery in 4-6 weeks for most stones. Express orders are available. Thank you for providing a beautiful stone so that we could remember and honor our precious puppy, Sophie. You exhibited great concern and you maintained contact with us throughout the process. God bless. 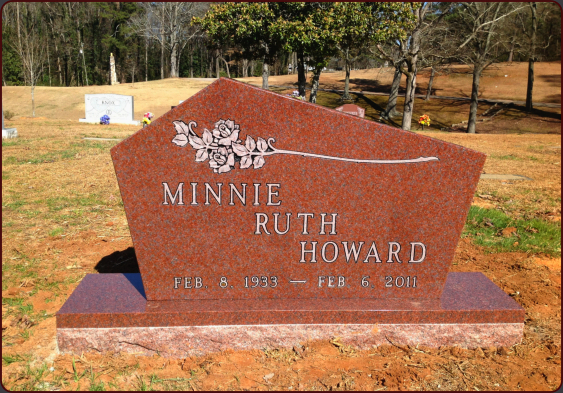 Thank you so much for the wonderful job you did for my mother’s granite monument. It warms my heart to know that her burial site is beautiful just as she was. Your team was capable and caring. You made what could have been a difficult process much easier for my family and we are forever grateful. God Bless!